Saint Frances Xavier Cabrini (also called Mother Cabrini), was the first American citizen to be canonized by the Roman Catholic Church. Maria Francesca Cabrini was born July 15, 1850, in Sant’Angelo Lodigiano Lombardy, Italy. In 1877, she took her religious vows and added Xavier to her name to honor the Jesuit saint, Francis Xavier. She became the mother superior of the House of Providence orphanage in Codogno, where she taught. In 1880, the orphanage was closed. She and six other sisters that took religious vows with her founded the Missionary Sisters of the Sacred Heart of Jesus (MSC) on November 14, 1880. The order established seven homes and a free school and nursery in its first five years. Its good works brought Mother Cabrini to the attention of Giovanni Scalabrini, Bishop of Piacenza and of Pope Leo XIII. The Pope sent Mother Cabrini to New York City in 1889, along with six other sisters, to help the Italian immigrants. 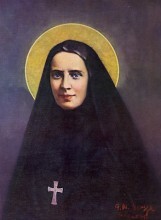 There she obtained the permission of Archbishop Michael Corrigan to found an orphanage, which is located in West Park, Ulster County, New York today and is known as Saint Cabrini Home, the first of 67 institutions she founded in New York, Chicago, Des Plaines, Seattle, New Orleans, Denver, Golden, Los Angeles, Philadelphia, and in countries throughout South America and Europe. Mother Cabrini was naturalized as a United States citizen in 1909. She died of complications from dysentery at age 67 in Columbus Hospital in Chicago, Illinois, on December 22, 1917 while preparing Christmas candy for the local children. In 1931, her body was exhumed found to be partially incorrupt and is now enshrined under glass in the altar at St. Frances Cabrini Shrine in the Washington Heights section of Manhattan. Mother Cabrini was beatified on November 13, 1938, and canonized on July 7, 1946, by Pope Pius XII. St. Frances Xavier Cabrini is the patron saint of immigrants.